then press the button Apply input. You may use the keys "y", "m", "d", "h", "n" to increase the year, month, date, hour, minute, or Shift key and "y", "m", "d", "h", "n" to decrease the year, month, date, hour, minute ! 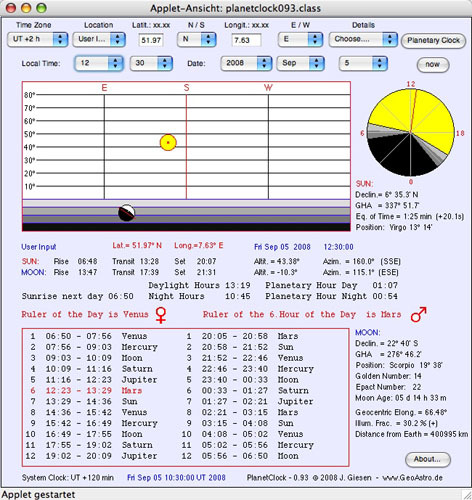 The planetary hours (also called unequal hours, Jewish hours, Italian hours) are an ancient system in which one of the seven traditional naked eye planets is given rulership over each day and various parts of the day. Monday is always the Day of the Moon. 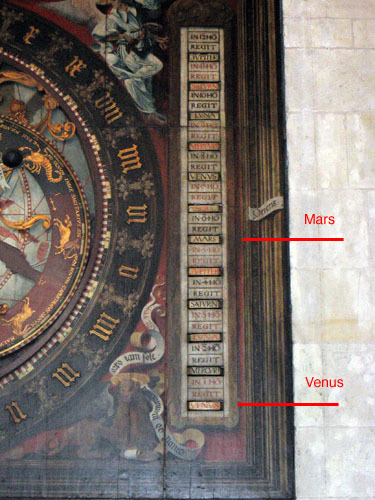 Tuesday is the day of Mars, Wednesday is ruled by Mercury, Thursday is Jupiter's day, Friday is the day of Venus, Saturday is the day of Saturn, and Sunday is the day of the Sun. The day is divided into two parts; the day (time between sunrise and sunset) and the night (time between sunset and tomorrow's sunrise). 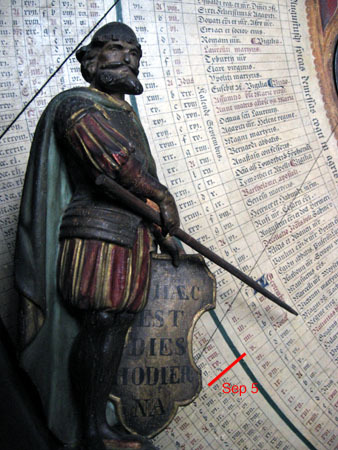 Each part of the day is then divided into 12 equal parts, for a total of 24 (unequal) hours.The further the location is from the equator; and the closer the date is to the solstices (as opposed to the equinoxes); the greater the difference in length between the length of the planetary hours and the clock hours. So the second planetary hour of the day of the Moon is the hour of Saturn, the third would be the hour of Jupiter, and so on.